Police found cocaine and ecstasy worth nearly £7000 when they raided a house in New Stevenston. 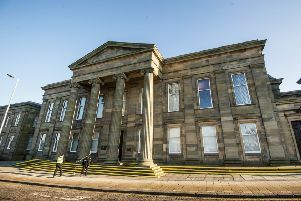 Jamie McCall (24), of Wrangholm Drive, admitted being concerned in the supply of the drugs when he appeared at Hamilton Sheriff Court. Michael McIntosh, prosecuting, said officers forced entry to the house on July 20 after a tip-off. They found quantities of cocaine and ecstasy in kitchen drawers. A drugs tick list, scales, rolls of bags and a cocaine-stained spoon were also discovered. Defence agent Luke O’Curry said his client has psychological problems. He asked that bail be continued while background reports are prepared. Sheriff David Bicket deferred sentence and ordered McCall to return to court on June 13.